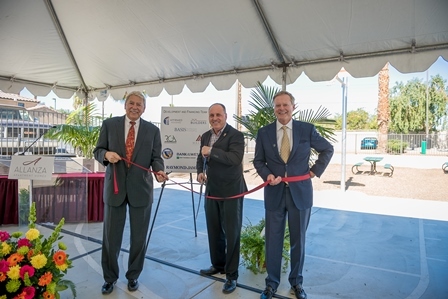 On Thursday, February 11th, Affirmed Housing, joined by Indio Mayor Glen Miller, celebrated the grand reopening of Allanza Apartments. Speakers included James Silverwood, Affirmed President & CEO, City of Indio Mayor Glen Miller, and County of Riverside Housing Authority Deputy Director John Aguilar. A $19 million endeavor, Allanza, home to 144 families, received extensive upgrades of both the interior and exterior. Serving those who earn 50-60% Riverside County AMI, this affordable community offers 2, 3, and 4 bedroom homes. Upgrades include complete refurbishment of each home, a new tot lot, basketball court, and drought tolerant landscaping. Resident utilities will be offset by the introduction of solar panels, low flow fixtures, efficient windows, and more. Most noticeably, Allanza features a new community building in the center of the property. The new building offers a full size kitchen, large screen TV, and computer lounge for resident use. Efficient upgrades are projected to lower resident utility bills by 50%. The 335 kilowatt (kW) solar system is estimated to generate 605,000 kilowatt hours (kWh) per year. “A positive acquisition for Affirmed Housing, Allanza Apartment Homes has undergone extensive renovations and we are pleased to be providing new and improved affordable housing for the local community. 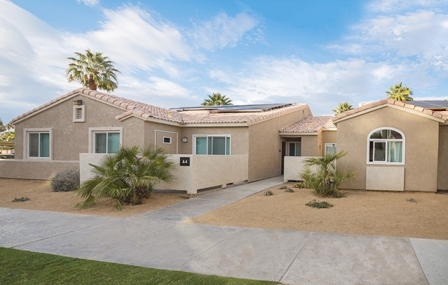 Most notably, we have enhanced the community’s solar efficiency while reducing our residents’ utility bills” states James Silverwood, President and CEO of Affirmed Housing.